The British Horseracing Authority (BHA) has today announced three new judges who will form part of the panel of 12 for the 2018 Godolphin Stud and Stable Staff Awards. The panel bring a wide range of expertise, skill sets and are geographically spread to ensure a fair and robust assessment of all nominations. Terry Doherty has been Stud Manager of Watership Down for 24 years and his professionalism, integrity and dedication has helped shape what the Stud has become today. He won both the Stud Staff Award and Employee of the Year at the 2017 Godolphin Stud and Stable Staff Awards. Alice Plunkett is a former event rider and Jump Jockey. She has been a broadcaster for over 15 years with Channel 4, BBC Radio 5 Live and most recently as part of the ITV Racing Team. She also sits on the board of Cheltenham Racecourse. Existing members of the panel include Racing Welfare and former Northern Racing College Chief Executive Dawn Goodfellow, former Jump jockey and self-employed businessman Mark Bradburne, National Stud Training Director Tabbi Smith and Hazel Peplinski, Chief Executive of Perth Racecourse. Dinah Nicholson, whose late husband David has the Newcomer category named in his honour, also forms part of the panel along with the National Association of Stable Staff Chief Executive George McGrath, Newsells Park Stud General Manager Julian Dollar and Ollie McPhail, Lead Education Officer of Racing to School. Brough Scott will continue in his role as Chairman of the panel. Brough Scott, Chairman of the judging panel, said:“The awards have not stopped growing in their 14 years so far and we have seen countless examples of the hard work and dedication that is required in a stud or racing yard. Alice Plunkett said:“I’ve been hugely fortunate to see the hard work and dedication of stud and racing staff first hand throughout my career, and I’m delighted to be on the judging panel for the 2018 awards. 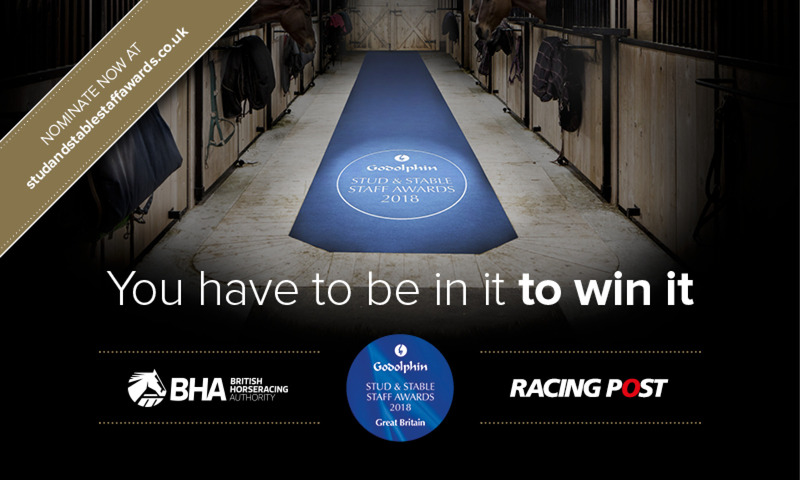 The Awards offer more than £125,000 in prize money, with up to £40,000 available to a single yard or stud. The prizes will be presented in front of an invited audience on the evening of Monday 19 February 2018 at the Jumeirah Carlton Tower Hotel in Knightsbridge, London.